I’ve had my head has been in the sand this month while I’m hard at work on some new books, freelancing gigs, and a few secret projects I’ll be rolling out very soon. But I wanted to come up for air to let you know I was recently interviewed by freelance writer and author Allen Taylor for his excellent site Taylored Content. 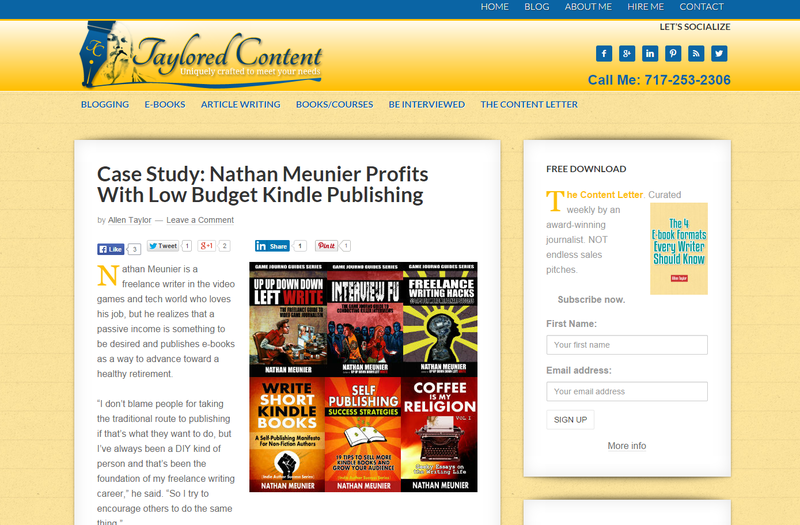 We chatted at length about my Kindle book self-publishing strategies, and Allen worked up a great info-packed case study! If you’re curious about Kindle publishing, you should definitely check it out here, and while you’re at it, scope out Allen’s new book and the other great content he has on the site, too!